Recently I had the chance to try out the new CoverGirl + Olay Simply Ageless 3-in-1 Liquid Foundation and was pleasantly surprised at how much I liked it! It’s been a couple of years (I think) since I have tried out a drugstore brand foundation. I usually just don’t even think of them when it comes to “face makeup” for some reason. Maybe it’s a lingering thought that because they are less expensive they aren’t as good. That can be true, but not always! As the name implies, this is a collaboration between CoverGirl and Olay. They have put Olay’s anti-aging ingredients into this foundation to help reduce the look of fine lines, improve skin tone and help with hydration. The foundation comes in twelve shades and comes in a pump style container. Ivory is the lightest shade in the collection and it suits me really well. It seems on the neutral side, not too pink or yellow. 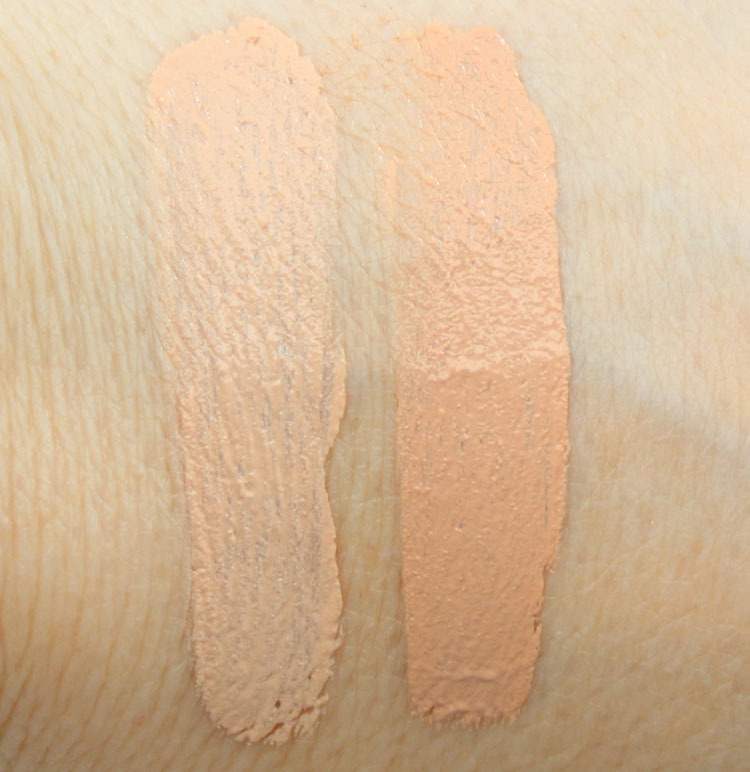 Creamy Natural is the third lightest shade in the collection. This shade is more yellow toned and obviously too dark for me. First I want to discuss the most noticeable thing about this foundation. That was the scent. It’s rather heavily scented to my nose. Well at least compared to most foundations, which don’t seem to have a scent. It has a very generic lotion-like scent but also maybe a hint of melon or flowers? Very hard to explain, but it’s definitely there. I kind of like it and hate it all at once. It does dissipate after wearing it for a bit. The texture of this is super creamy and very blend-able. I LOVE the texture. It’s almost mousse-ish. It does a really excellent job of covering pores, red spots, imperfections and has a nice finish. It’s not matte, but not super dewy either. It doesn’t look mask-like at all, and is very comfortable on my skin all day long. I would say it has a medium coverage. It is a little thicker than what I am used to, which is just basically a tinted moisturizer or BB Cream (I have been mostly wearing either the new UD Naked Skin One & Done or NARS Velvet Matte Skin Tint) but I really like the coverage! You can find this in drugstores now and it’s around $15.49 for 1 oz. Are you interested in trying this out? I love the Olay & Cover Girl combinations and will be buying this foundation when I need more. I would love to try this out. I just wish they made my shade. Ivory looks too dark for me! I just so happened to receive a sample of this in the mail today. I will try it out, but have my reservations cause of it being so fragrant. A lot of face products with fragrance will cause breakouts for me, so I’m a little leery. But ya never know. It would be nice to find a ds foundation that’s as good as what I usually use. $15-16 is, I feel, a lot for drugstore foundation. I don’t buy foundation that often, but personally, I’d rather pay the extra money for something really good. I’m not a fan of the brand owner, but I use Em Cosmetics foundation. It’s nice and lightweight and not super matte, but not super dewy either, and it’s only $23.